Standards: DIN ISO 9654. IEC 61340-5-1. Head shape: Narrow, pointed head. Design: Blade without facet, individually inspected, suited to thin, tough wire. Maximum service life of cutting edge achieved through additional inductive hardening to approx. 64 HRC. With opening spring. Surface resistance 10^6 - 10^9 ohms. Material: High alloy carbon steel C 60. 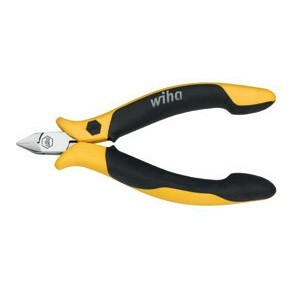 Application: For absolutely flush cutting of copper wire in places which are difficult to access.